I am really excited to be taking part in the John Lewis Technology for Living project and testing a Magimix 5200XL food processor. I’ve only ever had a small food processor attachment for my Kenwood and it has never been very effective, so I was wondering how I would get on with the Magimix. After using it for a month, I am totally won over and wouldn’t be without it! The Magimix, or magic machine as the girls now call it, is a seriously impressive piece of kit. 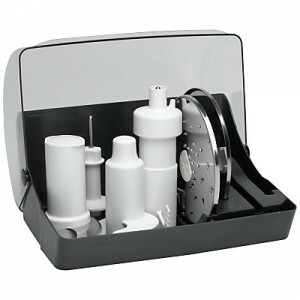 It comes with 3 different sized bowls and a whole host of accessories for slicing, shredding, chopping, whisking, grating and blending, which come in their own storage box. 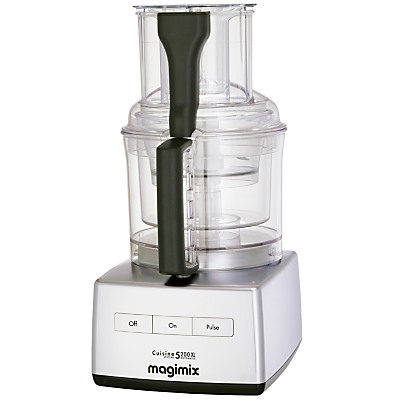 The machine we tested is the extra large Magimix food processor and is the perfect size for our family of four. I was worried that it would be too big to store effectively, but as all three bowls stack inside each other and the attachments have their own box, it sits neatly on the worktop without taking up too much space. Now we have this machine, we can have lots of really exciting and delicious meals! So, onto my recipes. First up, when it comes to warming Autumn food, soup is usually top of our list so I made a scrummy pea and pancetta soup. Next I made a cheesy leek and potato bake, using the slicing and grating discs. Finally, I couldn’t write a recipe post without some cake in it! So we have a delicious warm apple and cinnamon sponge pudding. A delicious and warming pea and pancetta soup, perfect for chilly Autumn days. Using the 2mm slicing disc, slice the onion. Heat the oil in a medium pan then gently fry the onion until it is cooked, but not coloured. This will take about 5 minutes. Finely chop the garlic and add it to the pan. Cook for a further 2 minutes. Add the hot vegetable stock and peas to the pan and bring to the boil. Cook for around 10 minutes until the peas are cooked through and tender. In the meantime, fry the diced pancetta in a small frying pan until it is crispy. Drain any excess oil and set aside. Leave the pea soup mixture to cool for 10 minutes then pour it carefully into the largest bowl, fitted with the largest blade. Blend the soup until it is smooth and all the pea skins have broken down. Pour the soup back into the saucepan and season with the salt and pepper. If the soup is a little thick, you can add some water or stock. Heat the soup or another 2-3 minutes. 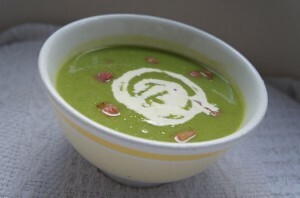 Dish the soup into separate bowls, add the pancetta and finish with a swirl of double cream. This cheesy leek and potato bake is a delicious family favourite. Jazz it up by adding some bacon or serve it with sausages or fish and green vegetables. Preheat the oven to 180°C then using the 2mm slicing disc, thinly slice the potatoes and leeks. Use the Magimix grating disc to grate the cheese, and set to one side. Mix together the creme fraiche, cream, mustard and salt and pepper, then stir in 3/4 of the cheese, reserving the rest to put on the top of the bake later). Grease the bottom of a 30cm round ovenproof dish. Place a layer of the sliced potatoes in the dish, followed by a layer of leeks and then a third of the cheesy sauce mixture. Repeat this. Repeat the layering process once more but add another layer of potatoes after the leeks this time before finishing with the cheesy sauce. Bake in the centre of the oven for 50 minutes. 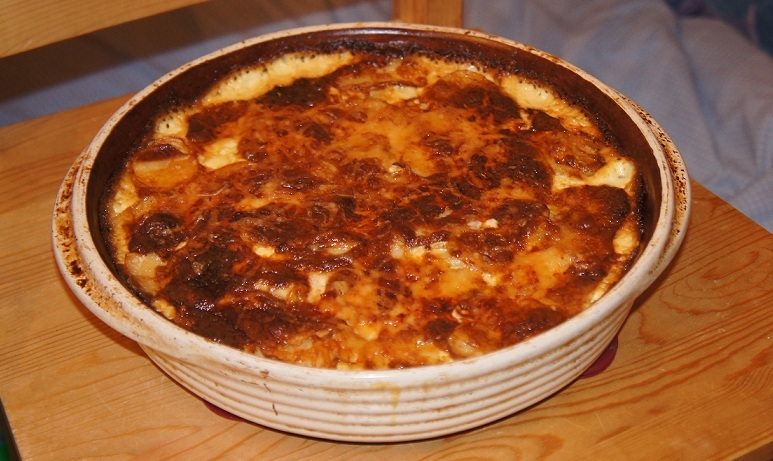 Sprinkle the rest of the cheese over the top and return to the oven for a further 20 minutes or until the potatoes are cooked through. Test with a sharp knife. Serve with green vegetables, sausages or fish. You can add some chopped, cooked bacon to the dish to jazz it up even more! A delicious warm apple sponge with a hint of cinnamon. 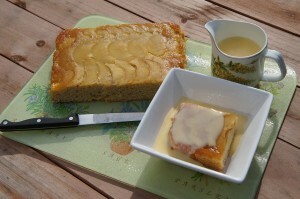 A perfect Autumn pudding when served with custard. Preheat the oven to 160°C. Line a 22cm by 22cm cake tin and drizzle the golden syrup over the base. Slice the apple using the 2mm slicing disc then arrange the pieces on the bottom of the cake tin in a pretty pattern. Use the large bowl of the Magimix with the large blade to mix together the butter (or Stork), sugar, eggs, flour and cinnamon. Pour the cake batter over the apple slices and spread it out so it is even. Bake in the centre of the oven for 30-35 minutes, until the cake is risen and golden. Insert a skewer to test if it is cooked - it should come out clean. Leave to cool in the tin for 10 minutes before turning the cake out onto a wire cooling rack. Remove the lining paper carefully. Serve warm with custard or ice cream. It's also yummy cold the next day and is a perfect lunch box treat. This is just a small selection of the recipes we tried out! There will be lots more to come! 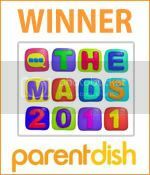 We absolutely love this machine and as a busy parent, I find the Magimix is invaluable. I’ve already been searching the John Lewis website or more Magimix gadgets (somebody hide the credit card!). Disclosure: I was sent a Magimix 5200xl food processor to test out. All views are my own. Previous postFlavrbox review Next postMake and Craft Blog Tour - and a giveaway too!